So you’re running a business, and you’re looking to keep things cool. To keep up with volume and demand, you might need a commercial ice maker, refrigerator or freezer that’s large enough for your needs. Of course, such appliances also consume a lot of energy, (on average, refrigeration accounts for 6% of a typical restaurant’s total energy consumption,) which is why it’s important to shop for things like the best commercial ice makers out there with energy efficiency in mind. Keep reading to find everything you need to know to land an energy-efficient walk-in freezer, refrigerator or ice maker for your business. Which uses more energy: commercial ice makers, refrigerators or freezers? Ice makers: Ice maker energy use is around 350 kilowatt hours (kWh) in a month—at a typical rate of $0.06 per kWh, that would cost around $21 a month. Refrigerators: A commercial 6×6 walk-in refrigerator might consume 600 kWh in a month and cost at least $36 to operate. Freezers: An energy-efficient walk-in freezer of comparable size would consume more than 2,200 kWh in a month, costing at least $136. The best commercial ice makers will handle a much larger volume than one meant for the home. It’s not unusual for a commercial ice maker to make 500 pounds of ice in a single day. What is a commercial ice maker? Commercial ice makers make large quantities of ice and are used in such businesses as restaurants, hotels, bars and hospitals. How do they work? 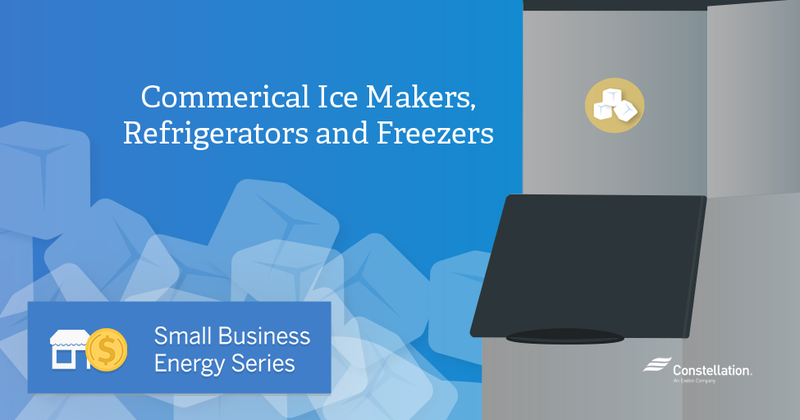 Commercial ice makers work by pouring water into a mold, supercooling it with refrigerant-filled coils, and storing the frozen water in the form of chips or cubes. The best ice makers can do this very quickly while keeping up with high demand. When shopping for the best commercial ice maker, it’s important to understand the difference between air-cooled and water-cooled models. Air-cooled ice makers: Air-cooled ice makers use fans to remove heat from the refrigerant coils, a process that causes the temperature to get cool enough to freeze the water. These are the most common ice makers on the market and the most environmentally friendly. Water-cooled ice makers: Instead of using air, water-cooled ice makers use water to transfer the heat away from the condenser coils. If water conservation is one of your goals, then water-cooled ice makers might not be for you. Though water-cooled ice makers tend to use less electricity, they use much more water—as much as 100 gallons for every 100 pounds of ice! As with any other appliance in your business, it’s important to maintain your ice maker to keep it working at its best. Fortunately, keeping your ice maker in good shape isn’t too hard. Choose an energy-efficient model. If you’re looking for the best ice maker, it’s a good idea to choose an air-cooled ice maker over a water-cooled one. 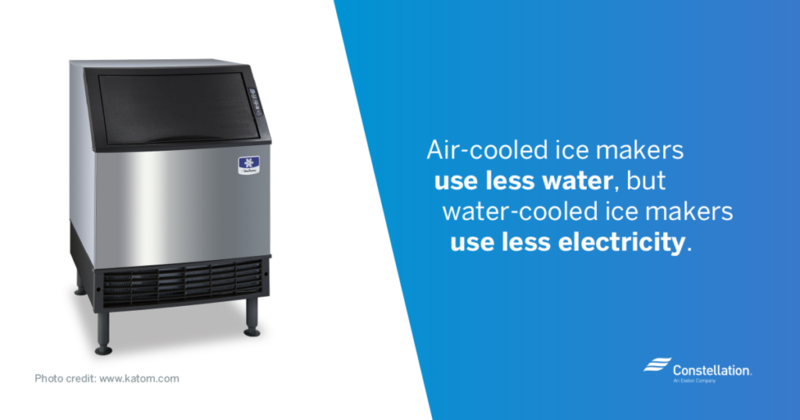 An air-cooled ENERGY STAR ice maker has a lesser impact on the environment, and owning one will keep your water bill down. Monitor water pressure. It’s important to ensure that the water pressure for your ice maker is within the range specified by the manufacturer. Adjusting the water pressure to the lower end of the recommended range can help reduce your ice maker energy use. Control water filtration. If impure water gets into your ice maker, it’s going to make impure ice. For the sake of your customers’ safety, consider using a filtration system as an extra safety precaution. The best way to cut down on ice maker energy use is to opt for one of the most energy-efficient ice makers on the market. The US Environmental Protection Agency’s ENERGY STAR program recognizes the most efficient equipment available, including the best commercial ice makers. 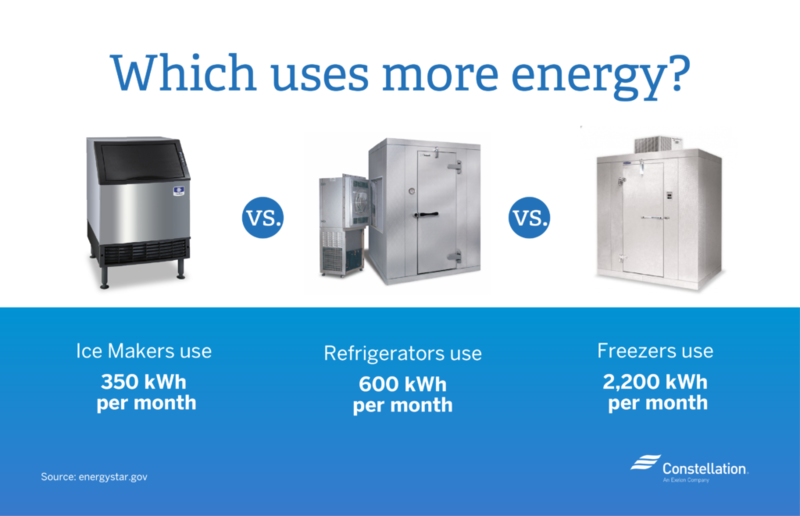 Energy consumption: Compared to conventional models, ENERGY STAR–rated ice makers are an average of 20% more efficient. The best ice makers can save 1,200 kWh of energy each year on average. Savings: When searching for an energy-efficient ice maker, it’s helpful to know that the energy savings of an ENERGY STAR–rated ice maker translates to $125 a year. Over the course of its lifetime, an ENERGY STAR ice maker could save you between $900 and $1,300. 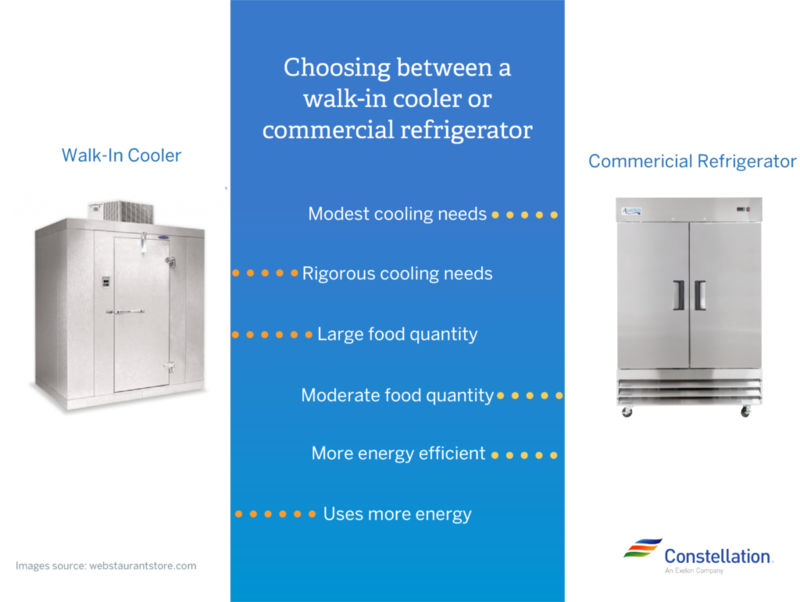 Restaurants and other businesses with significant cooling needs require larger refrigerators for their ingredients or products. Commercial refrigerators must stay at consistent temperatures reliably—even with frequent door openings. Depending on your business’s needs, you may opt for either a standard upright commercial refrigerator or a walk-in cooler. Commercial vs. residential refrigerators: In addition to being large in size, commercial refrigerators are most often made of durable stainless steel and other commercial-grade materials. Also, the temperature controls for commercial refrigerators tend to be more precise than those in their residential counterparts. HACCP: Hazard analysis and critical control points (HACCP) refers to a systematic approach to food safety administered by the Food and Drug Administration and the US Department of Agriculture. When shopping for a commercial refrigerator, you must ensure that it can satisfy HACCP protocol, which dictates the proper temperatures for food storage to prevent foodborne bacteria. Pro Tip: Many refrigerators have an “energy saver” switch. Find out which factors to consider when choosing an energy-efficient refrigerator. Walk-in coolers: As the name suggests, a walk-in cooler is a type of cooler that is large enough to walk inside. Businesses with ample cool-storage needs often opt for a walk-in cooler. Though walk-in coolers provide more cooling space, they inevitably use more energy than commercial refrigerators. Commercial refrigerators: Commercial refrigerators look similar to residential refrigerators, only they’re made of more substantial materials and can handle the rigors of commercial use. These refrigerators are better for more modest cooling needs within your business. Any business that needs to keep items frozen would do well to invest in a commercial freezer. However, which type of commercial freezer you buy depends on your freezing needs. Walk-in freezers: An energy-efficient walk-in freezer is ideal if you need to freeze a lot of items at once. These freezers start at 6×6 feet and go up from there in size. Commercial freezers: If you have limited space, then an upright commercial freezer is more likely suitable for your needs. One-, two- and three-door models are available. Investing in an ENERGY STAR–rated freezer or refrigerator is the best way to keep your energy bill down. However, there are plenty of other ways you can ensure energy efficiency throughout the lifespan of your appliance. Check door gaskets. The most important thing is to keep the air inside your freezer or refrigerator cold. Keeping door gaskets and automatic door closers in good condition is important for reducing wasted energy and food spoilage. Keep your system clean. Dust and dirt can affect the efficiency of your freezer or refrigerator. Take a moment every few months to make sure your freezer or refrigerator’s coils are adequately clean. Install motion-sensor lights. If your commercial freezer or refrigerator is also a display case, consider installing a motion sensor. That way, you can save energy by only having the light on when you need it. Allow space around the unit. The heat-exchange coils of a commercial freezer or refrigerator need good airflow to operate most efficiently. Make sure your system isn’t jammed against the wall or crowded by other appliances. Check refrigerant level. A freezer or refrigerator with low refrigerant will struggle to stay cool and use more energy as a result. You should be able to track the refrigerant level via a window near the condenser. Install LED lighting. LED lighting is far more efficient than traditional incandescent lighting, and LED lights give off far less heat. 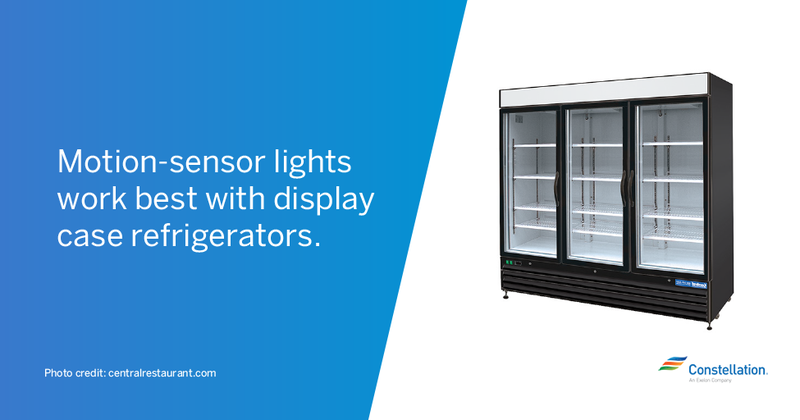 This makes LED lighting ideal for energy-efficient walk-in freezers and coolers. Purchase a vinyl strip curtain. In addition to installing an automatic door, you might also install a vinyl strip curtain near the entrance of your walk-in refrigerator or freezer. The strips are designed to stick together and keep the cold air in when the primary door needs to be kept open for a time. Add an evaporator fan controller. Walk-in refrigerators and freezers operate on cooling cycles. You can add an evaporator fan controller to control airflow when the compressor cycles off, maximizing your system’s efficiency. Pro Tip: LED lighting is the most efficient choice for all your lighting needs. Learn more about LED light benefits. For safety purposes, many food-service businesses need to cool certain foods quickly. When a standard refrigerator or freezer won’t do, a blast chiller or freezer system may be more appropriate. Blast chillers and freezers can reduce the temperature of food to a safe range very rapidly, whereas refrigerators and freezers are more geared toward keeping already-cold items cold. Depending on your needs, you may find a blast chiller or freezer to be a good addition to your kitchen. It’s important to note that some models provide both chilling and freezing in one appliance. Blast chiller: A good blast chiller can reduce the heat of a food item from 194 degrees to 38 degrees Fahrenheit within 90 minutes. Once the hot item reaches the ideal coolness, it can then be stored in a refrigerator. Blast freezer: Blast freezers work much like blast chillers, only they make food much colder. Blast freezers are great for making ice cream or for cooling food items to a temperature that’s safe for storage in a standard freezer. Is a blast chiller right for you? A blast chiller might be a good purchase for your business if you often buy in bulk, if you consistently deal with food safety concerns or if you spend a good deal of time waiting for food to cool in order to continue production. Storage: To buy in bulk, and then chill or freeze certain foods for later use, is a great strategy for cutting costs. A blast chiller is perfect for quickly cooling foods to the ideal temperature for storage. Food safety: The less time food spends in the “danger zone” (roughly 4 to 60 degrees Celsius), the lower the chances of foodborne bacteria growth. 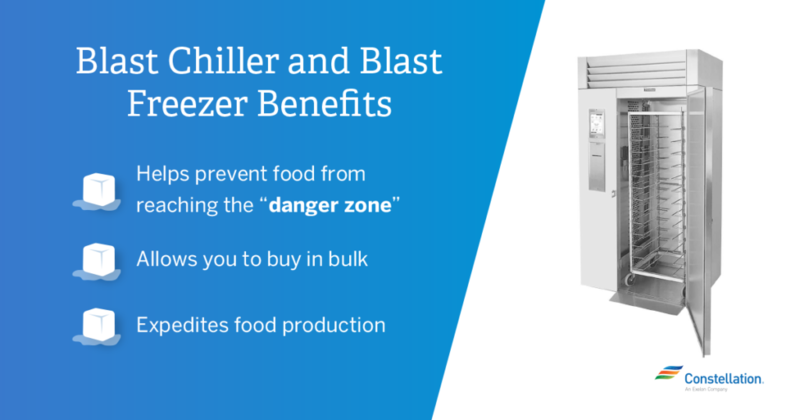 A blast chiller is perfect for getting food out of the danger zone so it can be safely consumed later. Food production: A blast chiller may come in handy if you work in food production. In addition to preventing foodborne bacteria, rapid cooling can streamline your production process. Choose the correct unit size. Efficiency won’t matter much if you don’t have the correct size of blast chiller. Spend some time determining how much you expect to chill at once to avoid energy waste. Space the trays evenly. It’s OK to chill or freeze less than a full load at once. If you do, be sure to space the trays evenly to hasten the chilling process. Use a food probe. Sticking a food probe into the thickest part of the chilling food will let you determine when the food reaches the ideal temperature. This will prevent unnecessary chilling. Pro Tip: Other ways to reduce your business’s energy consumption include cleaning out the refrigerator and using power strips to reduce phantom energy drain. A little homework on commercial cooling equipment goes a long way, and investing in the right commercial cooling equipment, such as an energy-efficient ice maker, is crucial for fulfilling your business’s needs and keeping your energy bills low. To find more energy tips for your small business, check out Constellation’s blogs about Small Business Energy Savings!